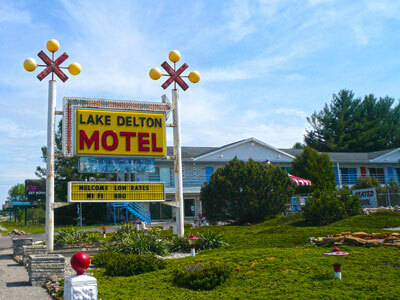 Lake Delton Motel in Wisconsin Dells is located on 3 acres of vacation delight right at the gateway to the Parkway rides and attractions of the Dells. The Lake Delton Motel offers a heated outdoor pool, tree- lined picnic area and game courts in addition to its clean and comfy rooms. You’re close to great shopping, theater, golf, and fine restaurants as well as being a stone’s throw from spectacular scenic beauty and the water park wonderlands of Wisconsin Dells. At the Lake Delton, you will be comfortable, contented and close to enjoyment during your stay in the Dells.